The famous William Carlos Williams poem "This is Just to Say" was used as the inspiration for an entire book by Gail Carson Levine called Forgive Me, I Meant to Do It: False Apology Poems. 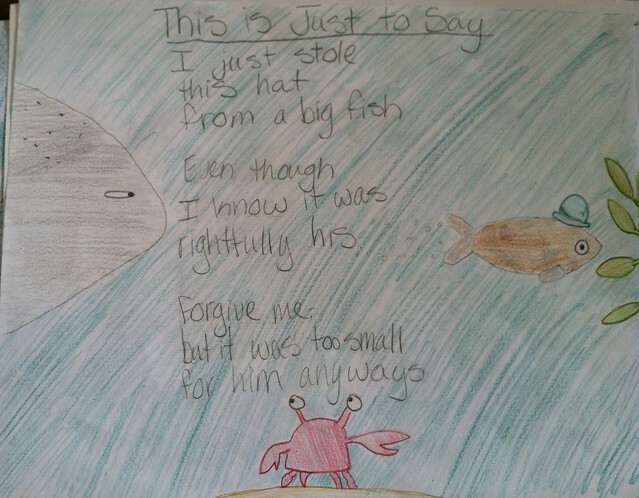 What is so brilliant about this book is that it inspires students and adults alike to write their own false apology poems. to chop off your arm. And I had to share this one with the illustration since it relates to one of my students' favorite picture books this year, This is Not My Hat by Jon Klassen. I love the idea of students being inspired by multiple pieces of literature. What would your false apology be?